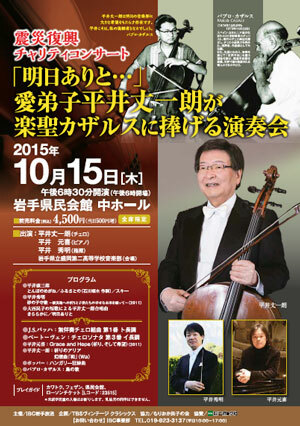 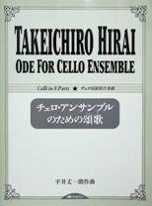 Artists: Takeichiro Hirai (cello), Hideaki Hirai (conductor), Motoki Hirai (piano), etc. 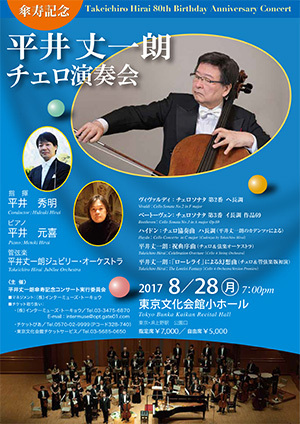 Takeichiro Hirai will be a special guest artist conducting works by Koto Master (Iemoto) Yasuko Nakashima, celebrating her 90th Birthday. 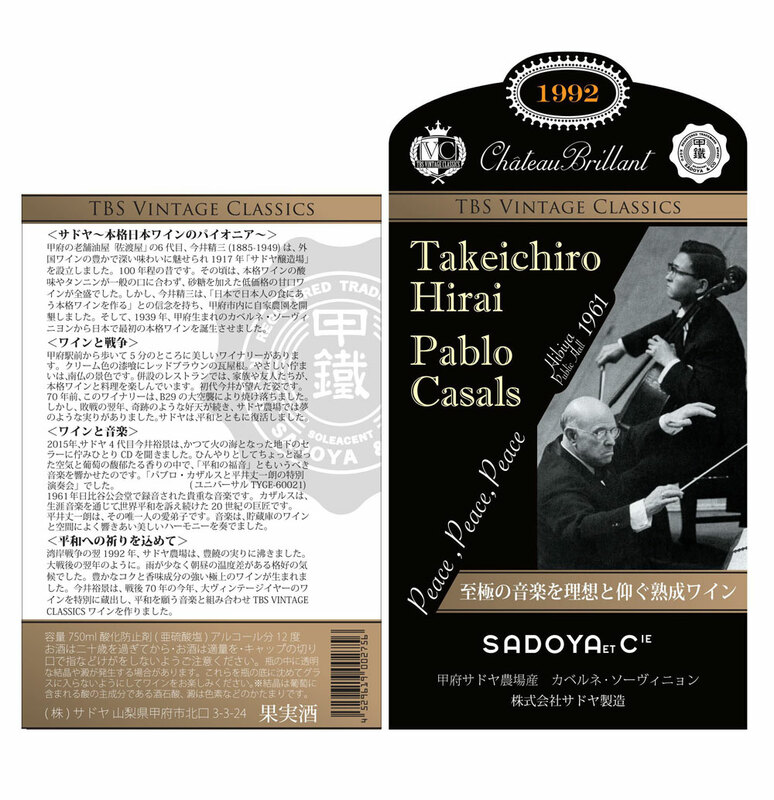 Vintage wine “Takeichiro Hirai and Pablo Casals” (Chateau Brilliant 1992) will be released by TBS Vintage Classics / SADOYA, celebrating Takeichiro Hirai’s 60th Anniversary of Professional career as a cellist. 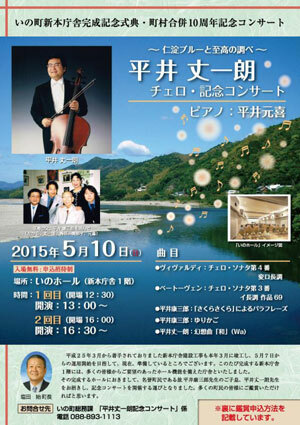 Article on the Cello recital on 10th May 2015 at Ino Hall and the ceremony to celebrate the opening of Kozaburo Hirai Memorial Gallery in Ino-cho, Kochi Pref., Japan. 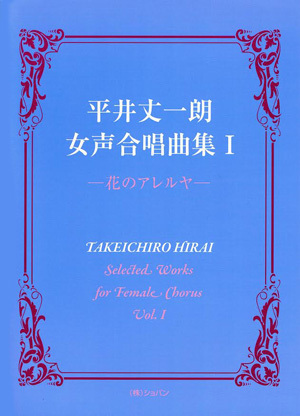 Takeichiro Hirai was commissioned to write the school song of Yoyogi-Sanya Elementary School (Shibuya, Tokyo) founded in April 2015, which will be performed at the opening ceremony of the new school. 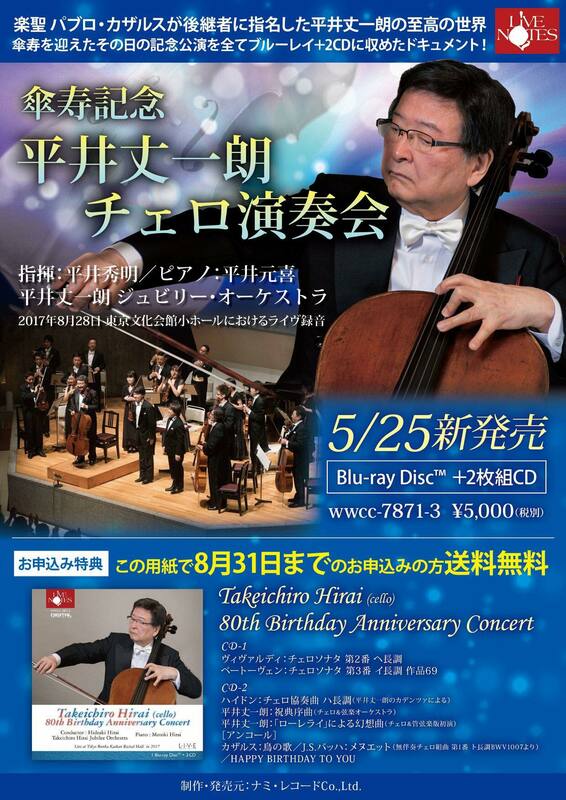 Live recording CD of 47th Concert of Contemporary Japanese Lieder presented by Association of Composer and Authors in Japan (Chairman: Takeichiro Hirai) will be released. 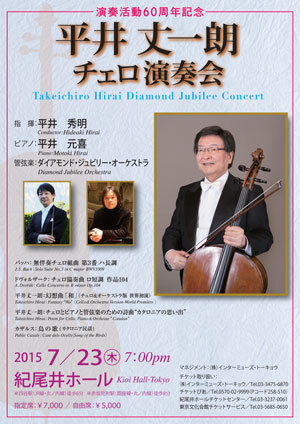 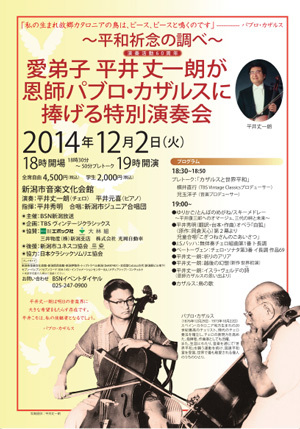 Programme to include Works for cello and piano by J.S.Bach, Beethoven, Casals and Takeichiro Hirai. 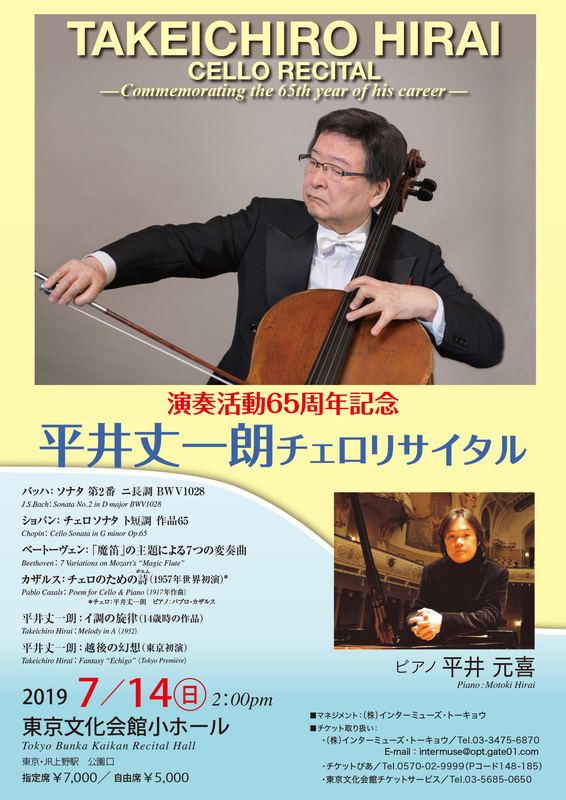 ‘JASRAC NOW’ – An Article on 47th Concert of Contemporary Japanese Lieder presented by Association of Composer and Authors in Japan (Chairman: Takeichiro Hirai), where Takeichiro Hirai premièred his new composition. 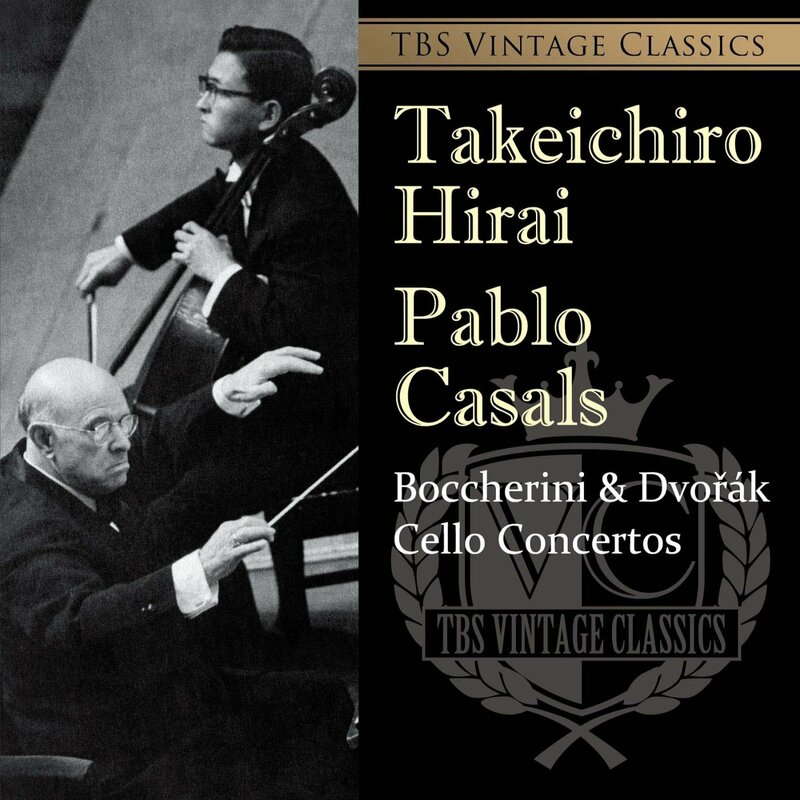 Live recordings of 1961 historical début concert by Takeichiro Hirai, performing cello concertos by Dvorak and Boccherini under Pablo Casals conducting with special bonus track of the official speech made by both artists which broadcast on radio at that time. 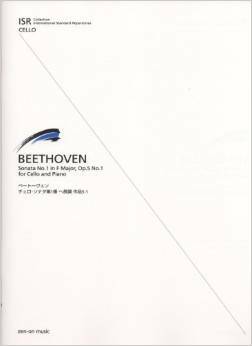 All the tracks have previously unreleased.